We are a Music and Theatrical Production Company based in Los Angeles, California that serves the American, Hispanic and Jewish market for over ten years. We offer high quality live entertainment (solo performers, bands and dancers) for all type of events (small or large private parties, weddings, Quinceañera, Bar/Bat Mitzvah and coorporate). In this website you can listen and watch some clips of shows we offer and music samples from the categories shown at the Menu. If you are an Event Manager, Programming Director, Producer, Publisher, Songwriter or a Buyer of musical licenses you can count on our services. Please send us your inquiries in the Contact section. Marcos Cohen, is Licensed in Mass Communication specialized in Advertising. He is an actor/singer, playwright and composer born and raised in Uruguay currently living in Los Angeles, CA. Cohen started his artistic career working in Musical Theatre. He wrote the music and book of more than 10 plays such as "Al Jolson, The Show Must Go On", “A Magic Book”, “Tito, The Big Menace”, “Robotic Park”, "CUCU Beat Show", "The Creation" among others. His song “Hay que cantar” was awarded for best original song at the “World Championships of Performing Arts (2000)” in Los Angeles. Cohen made his debut in Hollywood directed by Robert De Niro for the movie "The Good Shepherd" (Universal, 2006.) 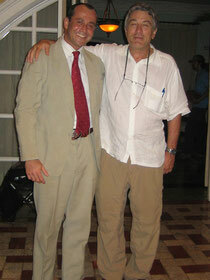 He played the president of Guatemala (Dr. Ibanez) next to the stars Matt Damon and Angelina Jollie. Clip: Scenes from "The Good Shepherd"